We have chosen a number of everyday scenarios which people, with some degree of hearing loss, may find challenging. By answering a series of simple questions you can quickly tell whether you have some degree of hearing loss – meaning that you could possibly experience a better life, in meaningful situations. Do people seem to mumble or speak in a softer voice than they used to do? Do you have difficulty following a conversation in noisy surroundings like in a restaurant or at a party? Do you sometimes answer a question and realize afterward that you did not understand the question correctly? Oticon Intigai is designed to be unnoticeable to you and everyone else too. 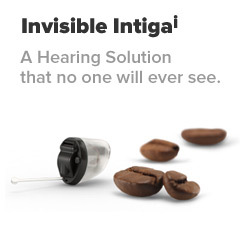 Intigai is Oticon’s most invisible hearing solution. It is shaped to fit so snugly inside your ear that no one will see it, or even realize you are wearing it. Not only is it invisible to everyone else, Intigai is designed to fit seamlessly into your lifestyle so that nothing gets in the way of your regular daily routines. It blends inconspicuously and completely, so that you can continue to play an active part in life. The volume adapts automatically as sounds and places change throughout the day, so you can participate on equal footing with everyone else. Oticon Intigai will also minimally impact the rest of your life. Fitting inside your ear, it will not affect your use of headsets or telephones, nor how you wear your glasses, nor even how you do your hair. Curious? Call or Drop in for more details.